By way of pre­pa­ring for the regio­nal youth sci­ence com­pe­ti­ti­on ‘Jugend forscht’ in Lin­gen in Febru­a­ry 2017, four pupils from the Gym­na­si­um Maria­num secon­da­ry school are con­duc­ting expe­ri­ments in our lab and green­house in Gees­te. They want to know: what’s the hype about “effec­tive micro-orga­nisms” all about? And what impact do air pol­lut­ants have on plants? Equip­ped with a woo­den ruler, Alex­an­der Base­ni­us leans over his tri­al crop – a batch of basil plants – at Klasmann-Deilmann’s green­house in Gees­te. After an app­rai­sing glance at the ruler, he pulls out his pen­cil and enters the figu­re in his table. Tog­e­ther with his school­ma­te Timo Väh­ning, the Year 8 pupil is keen to del­ve deeper into the world of EM (effec­tive micro­or­ga­nisms, tou­t­ed as a ‘mira­cle solu­ti­on’). Pro­duc­ts are com­mer­ci­al­ly avail­ab­le that con­tain blends of lac­tic acid bac­te­ria, yeast fun­gi and other micro­or­ga­nisms. It has been clai­med that they crea­te a favoura­ble envi­ron­ment that impro­ves the soil and enhan­ces yields. “I’ve read a lot about it online and I thought, “It can’t be that gre­at,” says Alex­an­der, a keen ama­teur gar­de­ner. And so the two of them have star­ted a series of tri­als at Klasmann-Deilmann invol­ving basil and pep­per plants: for com­pa­ra­ti­ve pur­po­ses, they have added to the sub­stra­te eit­her the dose recom­men­ded by the EM manu­fac­tu­rer or dou­ble this amount. As a con­trol, they are also moni­to­ring growth of plants wit­hout added EM. Young plants did inde­ed show stron­ger growth whe­re EM was used. Alex­an­der and Timo now want to inves­ti­ga­te the rea­sons for this, so that they have a satis­fac­to­ry ans­wer rea­dy in time for the com­pe­ti­ti­on in ear­ly 2017. Two other pupils, Sebas­ti­an Berent­zen and Chris­toph Tha­le, are loo­king at aero­sols. An aero­sol is a mix­tu­re of minu­te par­ti­cles in the earth’s atmo­s­phe­re. The­se may be pol­len or spo­res, desert dust or sea salt, or inde­ed man-made par­ti­cles deri­ved from com­bus­ti­on or other indus­tri­al pro­ces­ses. The two pupils from the Maria­num school are focu­sing on air pol­lut­ants. They are explo­ring the influ­ence of the­se forms of envi­ron­men­tal pol­lu­ti­on on plant growth. 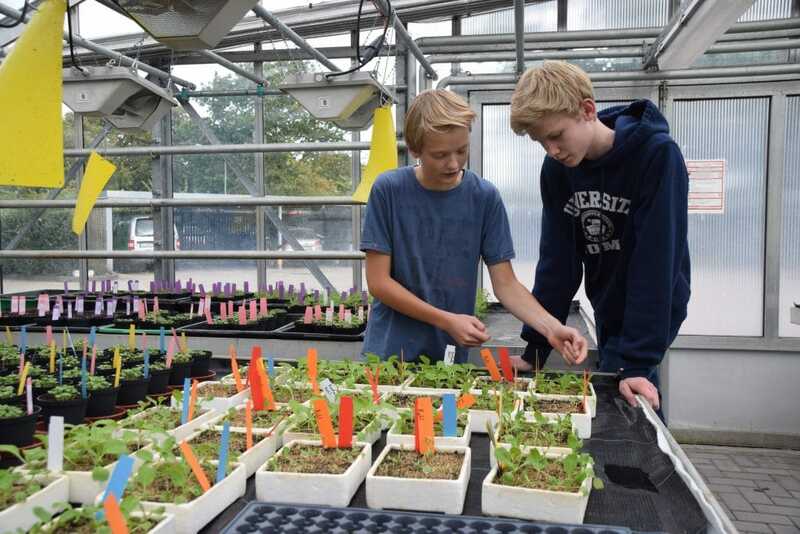 For their tri­al series invol­ving let­tuce and cabba­ge plants, they are app­ly­ing a liquid mix of che­mi­cals to both the seeds and the plants that they grow into. “This is to rea­listi­cal­ly simu­la­te the real-world situa­ti­on when pol­lut­ants enter the atmo­s­phe­re and are then taken up by plants,” says Chris­toph – aero­sols being invol­ved as they are in cloud for­ma­ti­on, resul­ting in plants absor­bing some of the­se pol­lut­ants via rain­wa­ter. The crops are spray­ed with the liquid at dif­fe­rent con­cen­tra­ti­ons and inter­vals to inves­ti­ga­te the impact when they are in con­stant con­tact with envi­ron­men­tal pol­lut­ants. One thing is alrea­dy clear to the young rese­ar­chers: “The plants are not only har­med by direct con­tact. Whe­re we spray­ed plants as seed­lings, the lea­ves don’t look good. This indi­ca­tes that the plants are also taking in the­se sub­s­tan­ces through the roots.” The task now is to find out how the dama­ging effect can be avoi­ded, or what scope the­re is for increa­sing the plants’ resis­tan­ce. Regi­na Wil­kens, who tea­ches bio­lo­gy and che­mi­stry at Gym­na­si­um Maria­num and is the coor­di­na­tor in char­ge of pro­mo­ting inte­gra­ti­on bet­ween technical/STEM sub­jec­ts at the school, had a good rea­son for approa­ching Klasmann-Deilmann with the school’s Young Rese­ar­chers club: “Several years ago, ano­t­her group of pupils con­duc­ted rese­arch at Klasmann-Deilmann – spe­ci­fi­cal­ly, into Ter­ra pre­ta or ‘Indian black earth’ soil. This pro­ved to be a mul­ti-award-win­ning pro­ject.” Wil­kens is keen to repeat this suc­cess and is hoping for a simi­lar­ly good out­co­me at the next ‘Jugend forscht’ event. ‘Jugend forscht’ (liter­al­ly, ‘Youth rese­ar­ches’) is Europe’s lar­gest sci­ence and tech­no­lo­gy com­pe­ti­ti­on aimed at young peop­le. It was laun­ched by the then edi­tor-in-chief of Stern maga­zi­ne, Hen­ri Nan­nen, in 1965.